A well kept secret for professional BBQ cook-off teams and outfitters throughout the United States. A seasoning, tenderizer, and marinade all in one. What separates Grub Rub® seasoning from the competition is how it sticks to the meat after only a 10 minute marinade. Once it becomes moist, it will not drip off. As the fire begins to cook the meat, Grub Rub® seasoning will create it's own delicious sauce to seal in the meat's natural juices and flavor. This old family recipe keeps the meat moist and tender throughout cooking. NO NEED TO ADD ANYTHING ELSE !!! 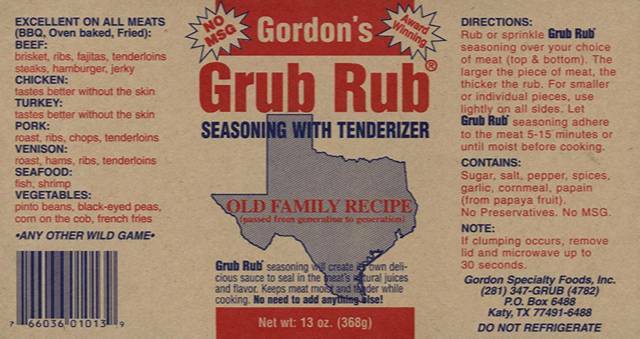 Grub Rub® is a registered trademark of Gordon Specialty Foods, Inc.
Adobe Acrobat Reader is required to view the online order form. To download the reader, click the image below.